Quite by accident, I may have come up with my best variation of the wintersown method so far for warm weather crops. On March 15th I filled the bottom half of two jugs with my grow mix and added about 1/8 cup of compost to the mix. I planted about 7 eggplant seeds of one variety in one and 3 seeds in another. Taped the bottom part of the jugs to the top parts. I put the jugs on top of the washing machine in the porch until the seed germinated. As soon as it did, I moved the jugs outside. My original intent was to transplant each plant to individual pots. Then it got cold again so I left them in the jugs. They were growing. It got warm again and I had other priorities. They continued to get bigger. Then it got cold again. I peaked through the top and things looked ok, but I was a bit worried about what I’d find when I took the top off. Finally today, I took the tops off the jugs and couldn’t have been more pleased. They looked fabulous! Remaining seedlings. Tomatoes, Peppers, and Eggplant. All grown outside in a jug using a variation of the winter sown method. Wait until the end of March or first of April to start my eggplant. Do it exactly as described above. By the time they’re the size in the picture, it’ll be time to put them in the garden. What a time saver! No watching, no watering, no worries. I’m liking this winter-sown method more all the time. I’m liking this wintersown method more and more! Thanks for the hints. Good obversations Theresa. I’ll add that I started a few eggplant and peppers in December as an experiment. I’d read that they’ll just wait and come up when the time is right. Well, they did, and hung in there since about January, HOWEVER – they are no farther along than yours are, and your eggplants look better. So nothing gained. Thanks for sharing this. Thanks for the input Sandra. Loved your comments Alice! Rules are definitely made to be broken. That’s how we all discover new things! If I am understanding you correctly — you are eating all this wonderful stuff because of the wintersown method? That is so exciting! So glad you shared this. I think it is especially wonderful that you live in Carson City, NV and are still able to glean ideas from a Virginia gardener. Thank you so much for letting me know about your situation. Knowing my readers makes TMG a lot more fun! I just now got around to reading this informative post. 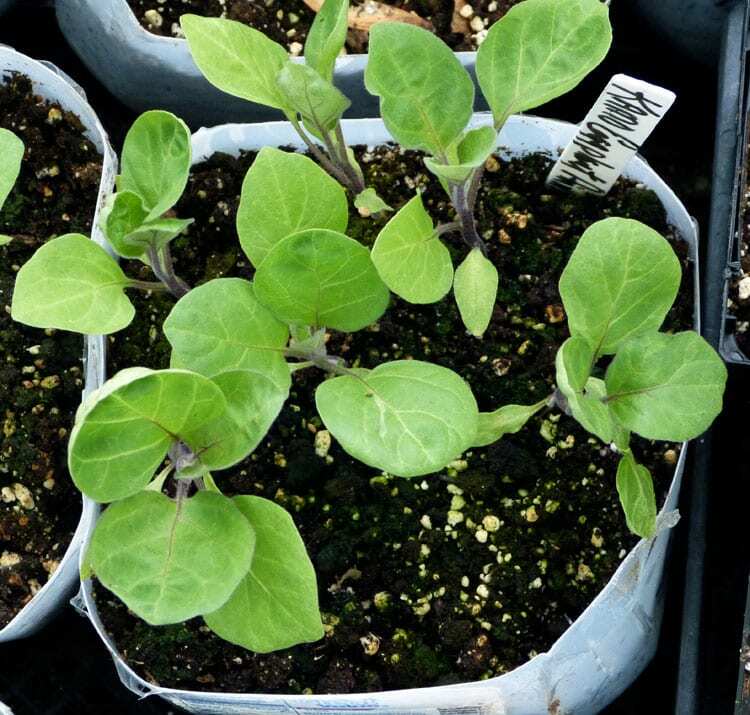 The eggplant seedlings definitely look better than what I grow indoors under the lights. What kind of “pro-mix” do you use? I’ve never used it but I see there is more than one type. Also, do you have any problems separating the seedlings without damaging their roots when grown this way? I was told that one needs to grow seedlings one-per-cell for this reason but apparently it works your way so long as they don’t get too large. Thanks. I use Sunshine Professional Mix 1 (Sunshine Mix #1 ). I buy the 3.8 cu.ft. bale. Ideally — one seedling per pot is great — but I don’t always have enough pots to do that. In this case, it was my intent to put each seedling in its own pot but other priorities came up and so they ended up growing together. Over the years I’ve had seedlings grow right next to each other in a flat, remain stunted while in the flat, and then take off like crazy when pulled apart and planted in the garden. “Ideal” is great when you can do it, but plants are tough and if you have to separate them — they are forgiving most of the time. I learned long ago that what people say you have to do is not always correct. Again — the “best way” is great if you can do it, but if you can’t — go for what you have to do — like separating seedlings. Theresa, Is this how you plan to do peppers this year also? Another question: Is your porch an enclosed one, or just a sheltered outdoor space? My eggplants went on to do NOTHING last year, so I’m hoping to try again this year using this method. I want to get peppers going in time to have them get RED. Yes, Sandra, I will do exactly the same this year. The porch is enclosed — but the jugs only stay on the porch until the seed germinates. The day after they germinate the jugs go outside. 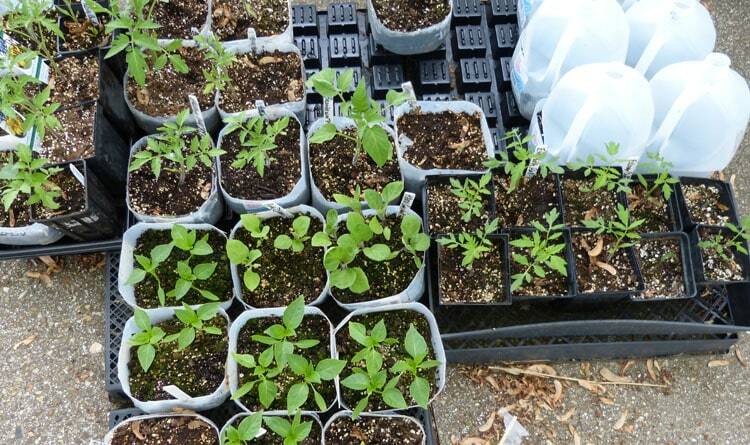 If I start seed in flats I transplant to a jug — seal it — take the cap off — and outside they go. Eggplant produced ok last year — but I did not think it was a particularly “good” year for it. Year before last was fabulous. Every year has its slight variables that can make a difference in how something performs.